It’s no secret we at Spark Hire see the video interview as the hiring tool of the future. But has the video interview really become a mainstream hiring technique? Online video is gaining traction as the internet becomes a more visual environment. Just a few years ago, Netflix was a company that sent out DVDs and Hulu was just a made up word. Now Netflix’s streaming service is arguably more popular than it’s DVD rental branch, while Hulu is the place to turn to catch up on all your favorite television shows. According to comScore, 84.9 percent of the US Internet audience watched online video in 2012. Americans watch up to 9 hours of online video per week. Plus 50 percent of smartphone users are watching video directly on their phone. So What About the Video Interview? Obviously, people love watching video online. It’s convenient and easy to watch your favorite TV show, web series, or even just a short video of a cat jumping into a box. (This is the Internet after all; everything becomes about cats eventually.) But what about using the video interview as an important hiring tool? There’s no denying video interviewing is starting to break into the mainstream. Thanks to built-in webcams in most laptops, it’s easier than ever before to perform a video interview with a top candidate. So just how mainstream is video interviewing? Six in 10 companies are utilizing video interviews in their hiring process, according to a survey by Office Team. Of these companies, 85 percent plan to use video interviews just as much in 2013 as they did in 2012. While 12 percent plan to increase their reliance on video interviewing. It should come as no surprise why: you can view 10 video screens in the amount of time employers can perform only one phone screen. Plus, video interviewing saves 67 percent of the travel costs associated with hiring. And remember all those smartphone users cuing up video on the go? Thanks to the Spark Hire mobile app, employers and job seekers can now view and record video interviews right from their smartphone. So obviously the video interview is becoming a more mainstream hiring tool. Employers and job seekers are realizing the potential of video to connect more easily and more personally. But what do you think? Are you seeing video interviewing going more mainstream? 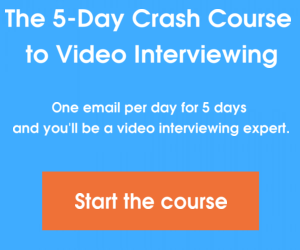 Do you think the video interview is just a fad? Sound off in the comments! How Do I Video Interview…Recently Fired Job Seekers?